About a week after the Replica Handbags UK runway show, a capsule of Dolce & Gabbana¡¯s Replica Designer Handbags collection, including the Louis Vuitton Replica Handbags label¡¯s headphones, was available through ecommerce platform Moda Operandi.With smart Breguet Replica Watches bracelets and watches, fashion has entered into a number of technology partnerships.Italian fashion label Fendi Replica UK developed a line of headphones with Replica Designer Handbags Beats by Dr. Dre, which were revealed at the label¡¯s spring/summer 2015 menswear show.The headphones, which are covered in the Fake Watches UK brand¡¯s Selleria leather used for its handbags and hand-stitched by Fendi artisans, are intended for 70-411 both male and female consumers. Since headphones are a personal statement, consumers loyal to the Rolex Replica UK brand will likely appreciate being able to show off their aesthetic through these devices. Want to learn more about Hoppe Equine Chiropractic? Email us. We will be happy to answer any questions you may have. 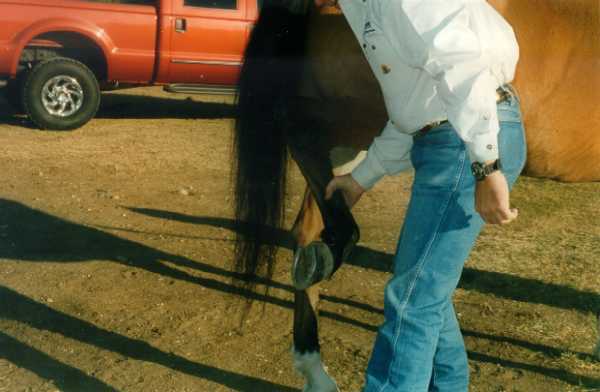 © Hoppe Equine Chiropractic, 2000. All rights reserved. Step 1: Lift leg and bend leg at knee. Step 2: Support knee in flexed position with both hands. Remember to stay close to horses body at all times. Watch your feet! Step 3: Raise flexed knee to 90 degrees or higher to obtain shoulder flexion. Remember to stay in line with body while stretching limb. Step 4: Extend knee and support bottom of knee with one hand. Step 5: While supporting knee with one hand, flex hoof by placing your thumb along coronet band and your index/ middle fingers on tip of toe. Step 6: While supporting knee, be careful not to hyperextend knee as you pull leg forward towards you. Observe chest muscles relax and contract as you do this. Don't Yank on leg. Let the horse give you the stretch. DON'T FORCE IT. 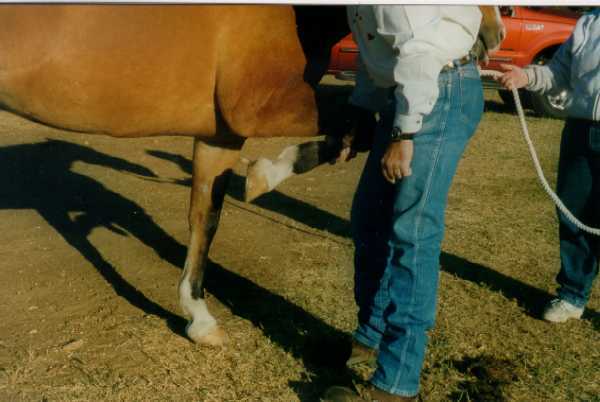 Step 7: Extend the horses shoulder and stretch the chest by placing the horses toe as far back as possible, having the horse plant his hoof under himself to finish the front stretch. 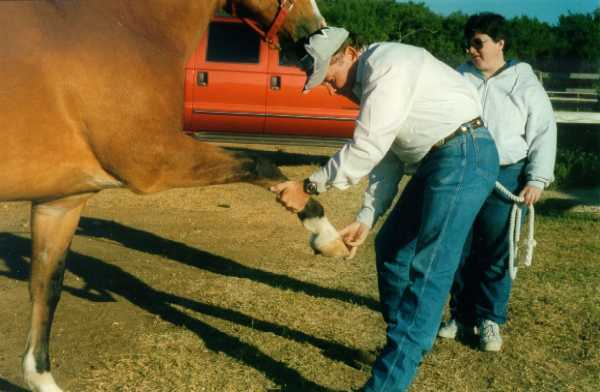 Step 1: Lift horses hind leg and flex to the horses belly. 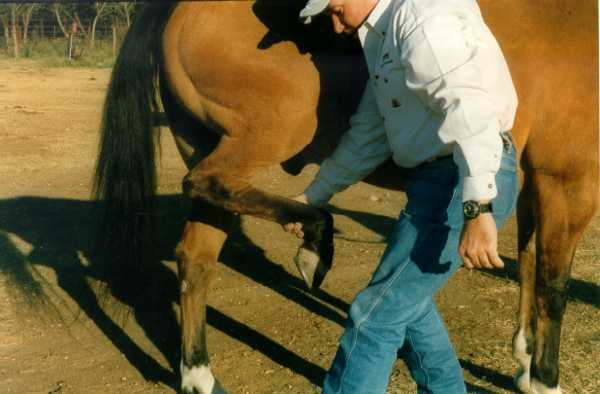 Step 2: Begin stretching horses leg forward by placing tips of fingers on the bottom of the horses hoof while gently pulling the horses leg forward. 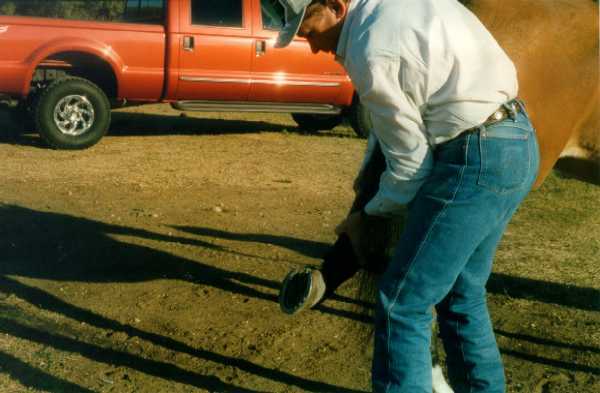 Step 3: Keep the horses leg close under the horse and in line with the horse. 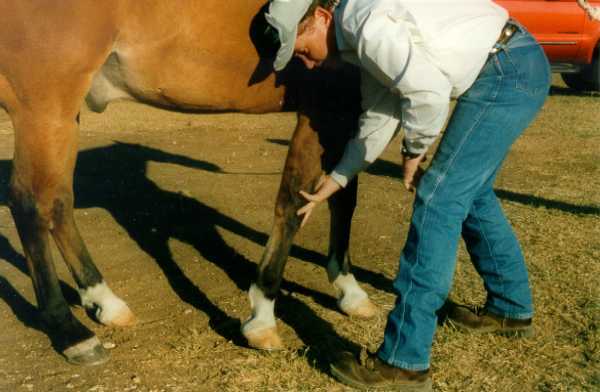 Try to touch the toe of the horses rear hoof to the back of the horses front knee( on same side). 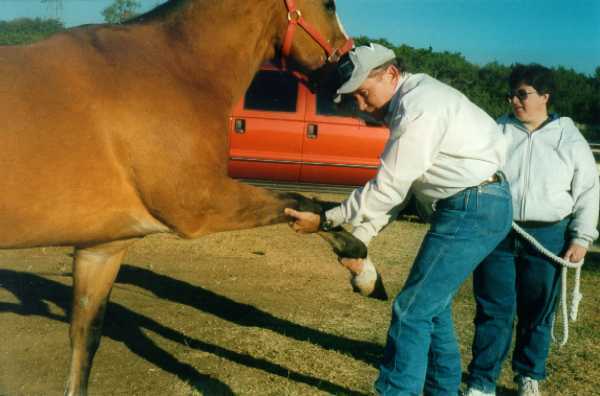 Step 4: Begin stretching horses leg backwards by placing hand between the horses Hock & Hoof (what feels best for you) and extending horses leg backwards. Always stay in line with the horses body. DO NOT PULL HORSES LEG OUT TO THE SIDE ! Step 5: Continue stretching the horses leg backwards by using both your hands and leg for support. 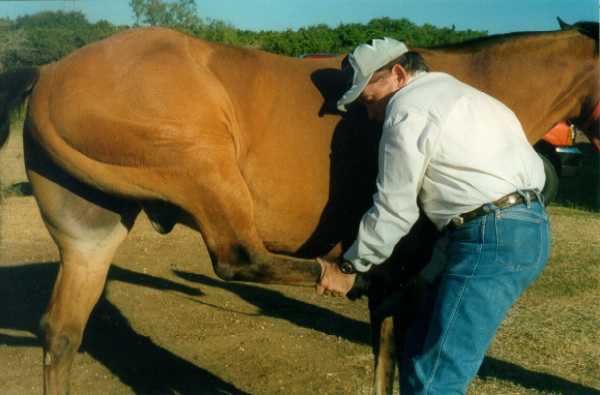 Step 6: Finish stretching the horse by fully extending the horses leg backwards. Most horses at this point will do this without much force or they will simply retract leg.......... TRY AGAIN ! Caution: Always position yourself in a manner to avoid being kicked ........ ALWAYS BE AWARE OF YOUR HORSE !